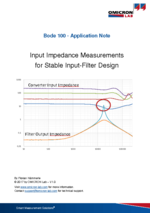 In this application note, we show how the Bode 100 can be used to measure the input impedance of a DC/DC converter and why this is important for system stability. In this application note, we are reviewing the theory behind the input filter stability problem. Why the input filter of a DC/DC converter can cause converter instability and how the negative input impedance of the converter contributes to this. Various impedance measurement setups for mW to kW converter applications are discussed and the settings details of Bode Analyzer Suite are explained. Based on a lab-experiment a bad input filter design is measured and the impact on the loop gain as well as on the transient response is analyzed. Successful filter damping reduces the input filter problem but still provides the advantage of a filtered input signal.